Fernando Alonso will return to Formula One at the Malaysian Grand Prix on Sunday after passing a medical examination by three Cambridge University doctors. The Spaniard, who was injured in a bizarre accident in testing in Barcelona last month, was given the all-clear by the British experts. He will go through final tests at the circuit in Kuala Lumpur later this week, but they are thought to be little more than a formality. Alonso’s McLaren team issued a statement, confirming that: ‘Subject to a successful final FIA medical assessment this Thursday, Fernando Alonso will return to the cockpit of his MP4-30 car. ‘Since his Barcelona testing accident, Fernando has followed a rigorous, specialised training programme, designed and closely monitored by leading sports scientists, to ensure his safe and timely return to racing. ‘At the McLaren Technology Centre last week, Fernando met with his engineers and drove the simulator, to bring him up to date with the latest developments on the MP4-30 chassis and power unit. As part of that process he spent time with senior engineers, discussing the accident and reviewing the comprehensive data and analysis, all of which has been shared with the FIA. ‘While there was nothing evident in the extensive car telemetry data, nor anything abnormal in the subsequent reconstructions and laboratory tests, Fernando recalls a sense of “heavy” steering prior to the accident. Consequently, the team has fitted an additional sensor to the car, to increase our data capture. 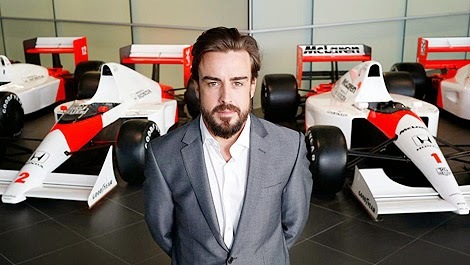 Alonso, 33, will therefore make his racing return for McLaren after leaving the team in rancorous circumstances eight years ago.